it tested fine by printing a test page. However, printing from an application like LibreOffice Write, or any other application for that matter, just resulted in an error and not printout. D [11/May/2011:14:50:51 +0200] [Job 32] envp="DEVICE_URI=lxusb://Lexmark/Pro200-S500%20Series"
D [11/May/2011:14:50:51 +0200] [Job 32] envp="PRINTER_INFO=Lexmark Pro205 via USB"
D [11/May/2011:14:50:51 +0200] [Job 32] envp="PRINTER_LOCATION="
D [11/May/2011:14:50:51 +0200] [Job 32] envp="PRINTER=Lexmark_Pro205_USB"
D [11/May/2011:14:50:51 +0200] [Job 32] envp="CUPS_FILETYPE=document"
D [11/May/2011:14:50:51 +0200] [Job 32] envp="FINAL_CONTENT_TYPE=printer/Lexmark_Pro205_USB"
This indicated that something call apparmor denies access to the printdriver file. Reading up on this, I found that apparmor has a profile that protects CUPS by default in Ubuntu. All one has to do to make printing work, is to tell apparmor where the Lexmark driver is and allow it to run. 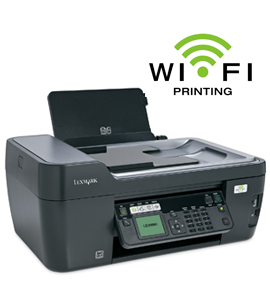 After restarting apparmor (sudo /etc/init.d/apparmor restart) the printer prints with both the USB and Wifi connections as it should. The scanner also work 100% with the simplescan sane frontend, but only via the USB cable, not via wifi. Faxing from the computer I haven’t addressed yet, since the print driver doesn’t expose the fax function. AppArmor often gives me hassle when I’m working with files in arbitrary locations. You can edit /etc/apparmor.d/usr.sbin.cupsd and add the path to the printdriver binary (/usr/local/lexmark/lxk09/bin/printdriver) under the existing entries for /usr/sbin/* etc. Or (less ideally) just put the cupsd profile into complain mode. When attempting to install the lexmark-inkjet-legacy-1.0-1.i386.deb.sh driver from Lexmark and lua error occurs. Lexmark support has send me this advice. Please delete the tmp folder that was created after extracting the shell script. Edit run.lua found in /tmp/config/run.lua. Change ownhership to ownership. Go back to terminal and type cd .. It seems that this problem was reported here more than a year ago, but the driver has not been updated by Lexmark since. Please message them and ask them to fix the simple mistake now! Installing these three drivers allows printing and scanning via USB of WIFI from Ubuntu. Very nice! Unfortunately I noticed today (18 Mar 2013) that Lexmark have removed these from their support site! These drivers (above) did allow printing with Ubuntu , but not network scanning with Ubuntu 12.04 & 12.10. It now seems that there is only support for Fedora 10 and OpenSuse 11.0 / 11.1 from Lexmark. Their helpdesk had this to say! I have downloaded the Fedora driver and with see if I can hack to work on Ubuntu 12.04 / 12.10 and report back if I succeed.